Search for all "Fibroblasts (Pan Reticular)"
Rat anti Human, Mouse, Porcine Fibroblasts (Pan Reticular) ER-TR7. Product is tested for Flow Cytometry, Frozen Sections. Epitope: The antigen has not been fully characterized. The epitope may be part of reticulin. Immunohistochemistry on Frozen Sections: 1 µg/ml (1/400) freshly prepared for Mouse tissue and 4 µg/ml (1/100) on Human/Porcine tissue. Recommended Positive Control: Mouse spleen. Does not react on routinely processed Paraffin Sections. Connective tissue consists of a ground of glycosaminoglycans, proteoglycans and glycoproteins through which various fibres run. These fibres can be collagenous, elastic or reticular. Reticular fibres are composed from the family of collagen proteins and give tensile strength. These fibres are made by reticular fibroblasts. Fibroblasts are the least specialized cells in the connective-tissue family. They are dispersed in connective tissue throughout the body, where they secrete a nonrigid extracellular matrix (ECM) that is rich in type I and/or type III collagen. Conective tissue consists of glycosaminoglycans, proteoglycans and glycoproteins through which various fibres run. These fibres can be collagenous, elastic or reticular. Reticular fibres are composed from the family of collagen proteins and give tensile strength. These fibres are made by reticular fibroblasts. The activation of fibroblasts by inflammatory stimuli results in their migration, proliferation and deposition of extracellular matrix components, important features involved in both wound healing and fibrosis. (The whole procedure is performed at room temperature). 11. 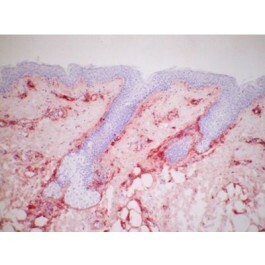 Counterstain with Mayers hemalum. Malan D, Reppel M, Dobrowolski R, Roell W, Smyth N, Hescheler J, et al. Lack of laminin gamma1 in embryonic stem cell-derived cardiomyocytes causes inhomogeneous electrical spreading despite intact differentiation and function. Stem Cells. 2009 Jan;27(1):88-99. doi: 10.1634/stemcells.2008-0335. PubMed PMID: 18927478. Achtman AH, Höpken UE, Bernert C, Lipp M. CCR7-deficient mice develop atypically persistent germinal centers in response to thymus-independent type 2 antigens. J Leukoc Biol. 2009 Mar;85(3):409-17. doi: 10.1189/jlb.0308162. Epub 2008 Dec 12. PubMed PMID: 19074554. Rangel-Moreno J, Moyron-Quiroz J, Kusser K, Hartson L, Nakano H, Randall TD. Role of CXC chemokine ligand 13, CC chemokine ligand (CCL) 19, and CCL21 in the organization and function of nasal-associated lymphoid tissue. J Immunol. 2005 Oct 15;175(8):4904-13. PubMed PMID: 16210592. Rehm A, Mensen A, Schradi K, Gerlach K, Wittstock S, Winter S, et al. Cooperative function of CCR7 and lymphotoxin in the formation of a lymphoma-permissive niche within murine secondary lymphoid organs. Blood. 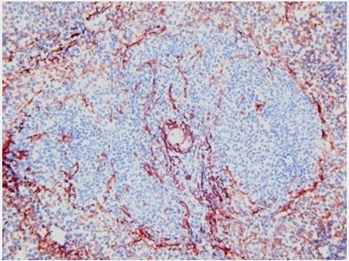 2011 Jul 28;118(4):1020-33. doi: 10.1182/blood-2010-11-321265. Epub 2011 May 17. PubMed PMID: 21586747. Tan KW, Yeo KP, Wong FH, Lim HY, Khoo KL, Abastado JP, et al. Expansion of cortical and medullary sinuses restrains lymph node hypertrophy during prolonged inflammation. J Immunol. 2012 Apr 15;188(8):4065-80. doi: 10.4049/jimmunol.1101854. Epub 2012 Mar 19. PubMed PMID: 22430738. 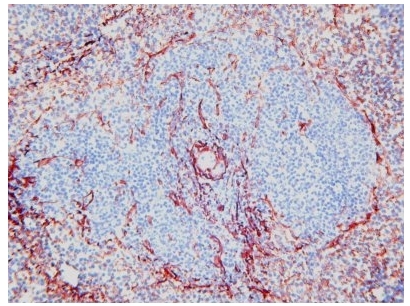 Van Vliet E, Melis M, Foidart JM, Van Ewijk W. Reticular fibroblasts in peripheral lymphoid organs identified by a monoclonal antibody. J Histochem Cytochem. 1986 Jul;34(7):883-90. PubMed PMID: 3519751. Restore with 0.5 ml distilled water. Mouse (Reticular Fibroblasts, Reticular Fibres), Pig and Human. Reacts with Mouse reticular fibroblasts, reticular fibres and Human tonsil. 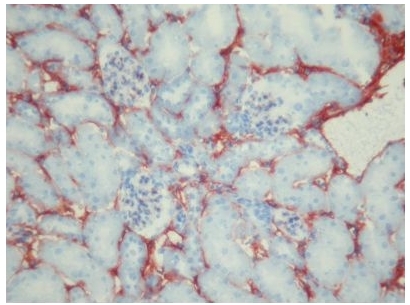 ER-TR7 detects an antigen present in and produced by reticular fibroblasts. The recognized antigen is most likely distinct from Laminin, Fibronectin, Collagen types I-IV, Heparan Sulfate Proteoglycan, Entactin, and Nidogen. 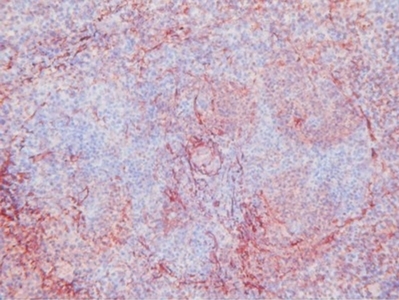 The antibody is useful to stain the microanatomy of various organs, in particular the connective tissue framework in lymphoid organs. 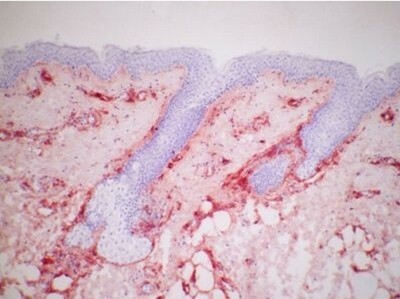 The antibody also stains subendothelial deposits in the plaque area of atherosclerotic plaques. 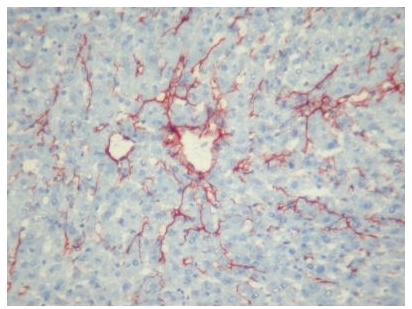 Isolated Cells: The antigen is found in the cytoplasm of fibroblast cell lines. 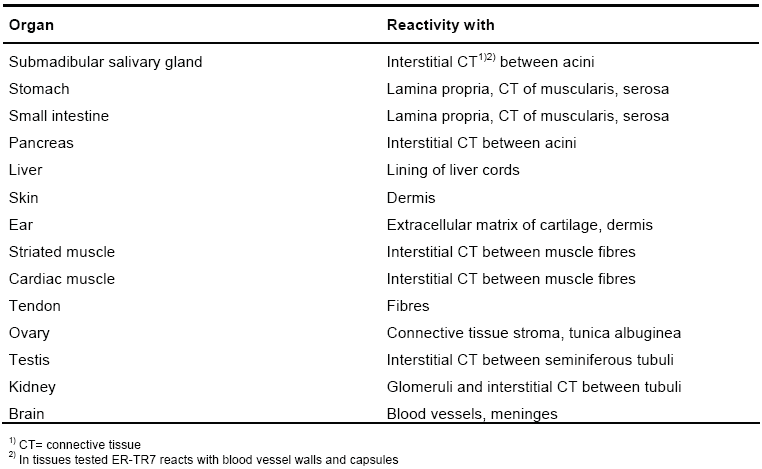 Tissue Sections: The antigen is expressed in connective tissues which form a supporting network between parenchymal cells of all organs tested so far (see table below). Thus, the supportive mesenchymal structures of larger vessels can be studied. In spleen, a very clear delineation of red and white pulp is obtained. Capsule, sinuses, follicules, paracortex and medullary cords are also clearly delineated in lymph nodes.